This 13-day bike tour is designed for the active travelers who intend to have an in-depth travel experience in China. 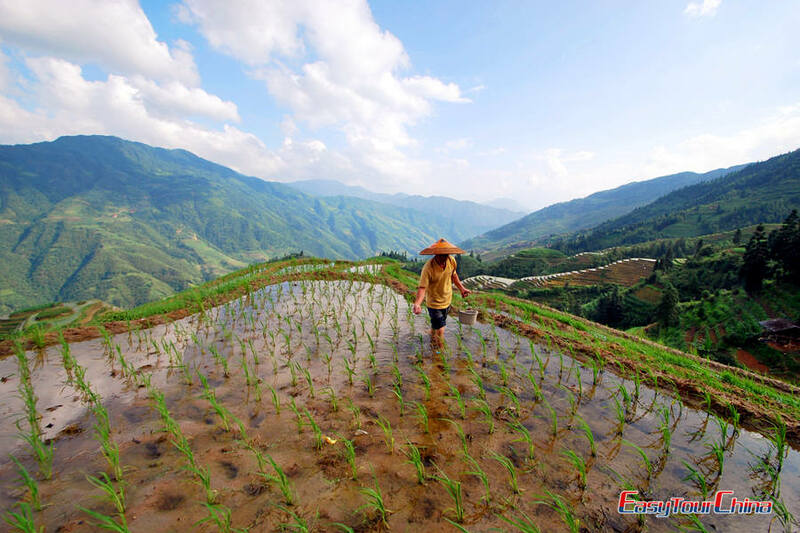 You will see: hardy farmers tilling lush rice paddies with water buffaloes, bamboo lined emerald rivers snaking through farmland and pine forest, mist swept limestone peaks and ancient villages dot the countryside. An undoubted highlight is cycling through the thousands of limestone karst peaks and ancient villages along the Li River. The tour is fully supported so you are worry-free about the cycling distance. 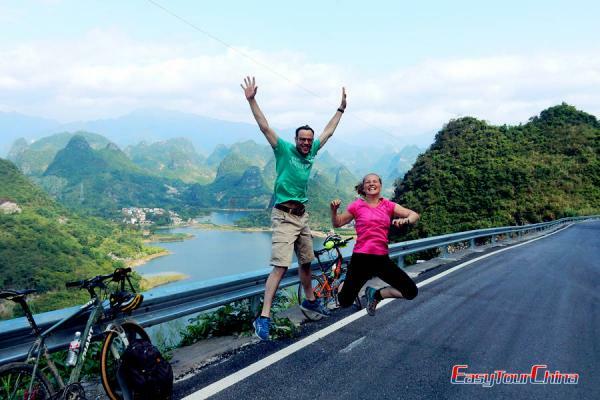 This tour covers all the must-visit parts around Guilin, and the cycles everyday are mainly on those side road and off the beaten tracks. 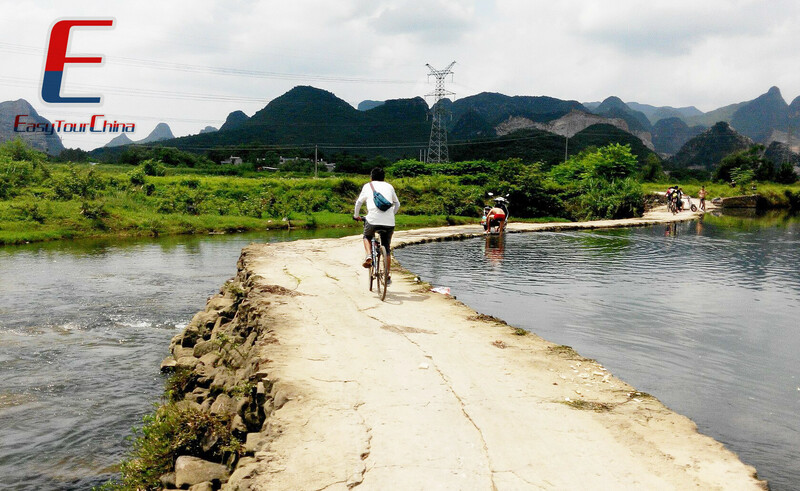 The tour was designed after years and brings you into an in-depth cycling and hiking adventure around Guilin. Most of the road on this tour is paved or simply paved. Guilin is connected by flights with major cities in China, like Hong Kong, Beijing, Shanghai, Guangzhou, Chengdu and etc. 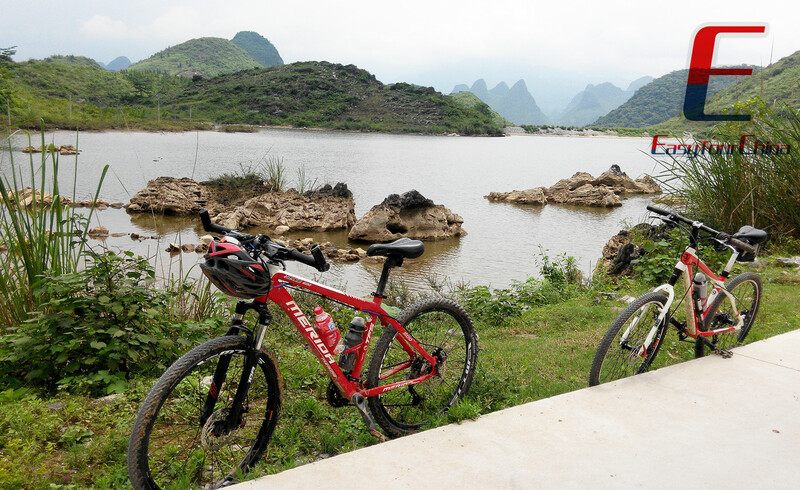 GuilinCyclingTours's rep will meet you at Guilin airport and take you to hotel. We'll get together for a group meeting in the early evening and test ride the bikes before heading out for a banquet of local restaurant. (No matter you are a skilled rider or a newbie, you will be given a professional basic user manual about the bicycle we offer and the matters need attention about this tour. You will get your bicycles today and have a try with tour leader. )If your flight arrives in Guilin in the morning, you will have more free time to visit the city. Today's highlights: fun-filled day, passing through university, well-preserved old houses and villages, trekking to see the hidden sacred waterfall, peaceful country road. 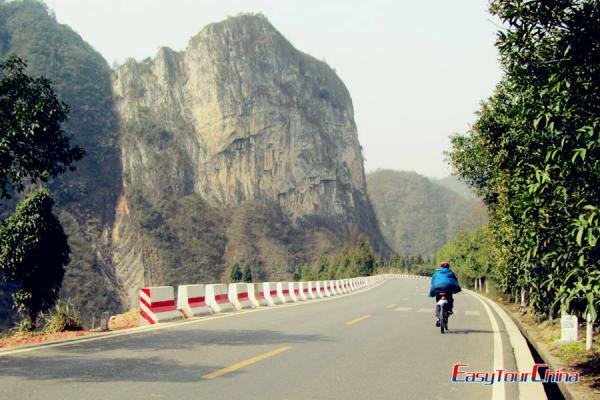 We will drive you outside the dangerous and busy Guilin city area directly and then start our cycling after 1 hour's drive when our car finishes the climbs section for today. We offer a wonderful and gentle start of the whole trip. After parking our car and trek to the wild and hidden jungle to see one of the gorgeous natural waterfalls in rural area of Guilin, we drive and start to cycle soon. After about 36KM cycling mainly on paved and flat, lunch at Xing'an county. Cycling the greenway lately built for cyclists along the Lingqu Canal for 28KM, enjoy the wonderful experience and the nice path there, and then our supporting van will drive us again back to Xing'an for a walk and rest. Xing'an is a historical county in northern part of Guilin, the symbol there - the Lingqu Canal was dug out in 214BC when the first emperor ruled China, and connected Guilin with central China by shipping ever since. Today's highlights: Avoid traffic and save our valuable time travelling in China, Danxia landform hills and trekking on the mountain . Today we head out early after breakfast for a drive to the north of Guilin to the UNESCO Heritage Bajiaozhai NationalPark, famed for its unique red sandstone karst formations. Once here we’ll hike up to the Buddhist temples (1800 steps) on the highest peak for incredible views overlooking the neighbouring province, Hunan.After a wander through these working temples and watching locals make offerings and wishes at these shrines it’s a walk down through bamboo groves to our homestay, with time to set up the bikes and a great little warm up ride if time permits. We’ll be staying with a local family in their small guesthouse and tonight’s dinner is local style banquet where we’ll make sure the local specialities and produce are featured. We may need about 2 hours driving from Xing'an county to Ziyuan, and another 1 hour on the van before arriving the Bajiaozhai scenic spot. The park is located on the boundary of Guangxi province and Hunan province, the landform and rocks there are so special and attracting people all over China. NOTE: When there are more than 3 paticipants of this tour, our leader will take you for a shuttle bus from Xing'an to Bajiaozhai as the supporting van is not available to carry everybody with all the bikes in the same time. Don't forget to change your cycling shoes into a common sport one as we are going to hike on the mountain for about 4 hours. (All stairs). 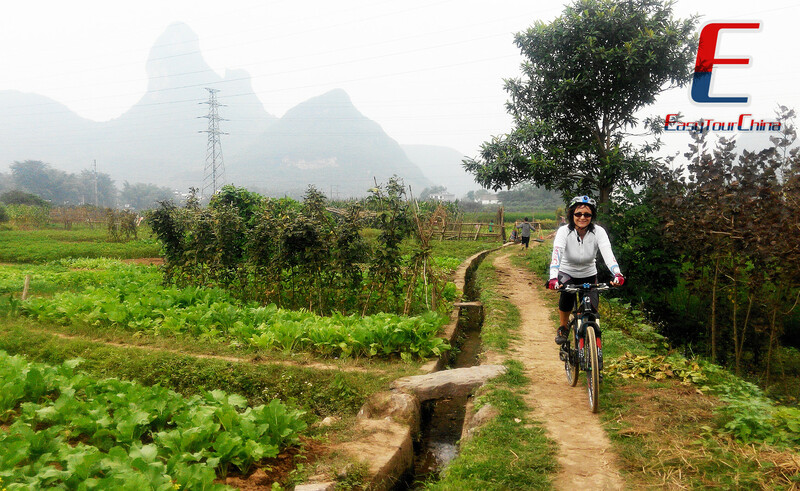 Today's highlights: Cycling through mountains in the north of Guilin, Miao minority people, villages and towns. Today’s ride is a varied one that takes us up into the mountains.For the first few kilometres we ride out of the park through tiny villages on quiet roads. It’s undulating terrain with forest and farmland as the backdrop where you’ll see local people tendingrice fields or livestock. We take a sharp ascent up onto a ridgeline, where things flatten out for a while, and rural China scenes abound, before descending into a wider valley and our lunch stopin the village of Guali. Local life is on the street here and peoplewill be curious to see foreigners here on bicycles, so a pre-lunchwander is highly recommended. For those that wish to transfer up tothe top of the hills our vehicles will be available. From the top wecan see the provinces highest mountain peak: Mao Er Mountain.The descent on the other side takes us through forests, narrow gullies and a ravine. We’ll pass numerous villages and wooden houses built on the mountainsides and nestled amongst rice terraces, fruit orchards and wild forest. We have a short ride out of Chetian town where we stay in a secluded valley in a quiet basic guesthouse with spectacular rock formations and waterfalls ideal for hiking and swimming. You can get up very early in the morning and trek up the hills again to see the sunrise in Danxia landform, but it's suggested to start for today's cycling as earlier as we can. We will not encounter too much difficulties in the morning, however, a big climbs lasts over 25KM will test us in the afternoon. Arrive at the peaceful and less commercialized town of Chetian in the afternoon. Today's highlights: Peaceful and well-paved road, Miao villages along the river, rest at deluxe hot spring and buffering for the whole trip. Today’s ride is a spectacular one as we have two passes, and descents, and plenty of time to stop and visit the many ancient villages along the way. 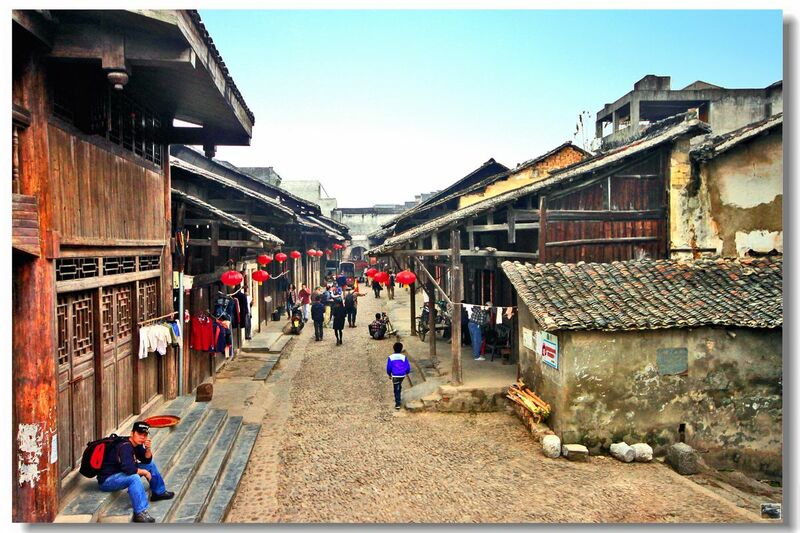 This area is inhabited by Dong, Miao andYao people and the villages see virtually no tourists. One of the great experiences of the region is to simply stop and visit. Local sare sure to welcome you with a smile and are proud to see youlook around their homes. It’s not uncommon to be invited in for anice cup of tea! After the second climb it’s a long gentle downhill ride to the Longsheng Hot Springs. Well known in the local area this is the perfect location to stop and soak your muscles after the days ride. We stay in a small family run guesthouse in a narrow gorge with an outdoor natural hot spring. There is a great hike along the gorge to a local Miao village for those with some energy left. Not too much difficulty challenges us today as the road surface is so nice. We enjoy our cycles along the river, surrounded by the rice terraces and typical wooden house of Miao minority people. We will arrive and stay overnight at the hot spring resort, and then enjoy the luxury and comfortable hot spring water bath. Today's highlights: Trekking on the mountains and enjoying the 'Dragon's Backbone Rice Fields'. A very morning soak in the hot spring again is not a bad idea. A late departure will not ruin the schedule of the day as most of the roads today are level. First 24km will be level along the river. Then you will be challenged by a few slopes. Upon arrival at the rice terraces car park and have lunch, we store up the bikes then drive and hike uphill (1.5hr) for our lodge on the rice terraces. The ethnic people of Yao have been living here for more than 400yrs and their flamboyant red color dress is a constant theme of picture taking. Annoying groups are inevitable as the terraces are SO famous! 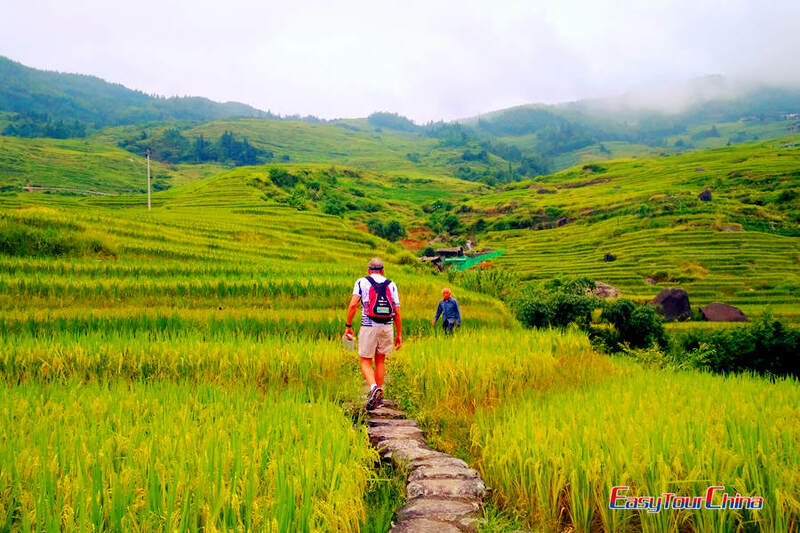 Most of the terrain for today will be flat or undulating but with asteep and challenging 4 mile / 6 km climb up to the Longji rice terraces to finish. Along the way we’ll pass through the county capital, Longsheng, where we’ll check out the local market. Thisis where much of the produce in the region ends up before being traded to far off locations around China or to kitchens locally. There is an extraordinary array of goods for sale, exoticand sometimes very strange, but always colourful and fascinating. We will arrive in Pingan, the village situated in them iddle of the rice terraces, with enough time so that you have time to sit back with a beer and enjoy the sunset views from the terrace of the Zhuang minority, traditionally-built guesthouse.The owners always make us feel at home and may offer us a sample of their special sweet rice wine. We will stay overnight at hotel or wood lodge on the rice terraces. Local people live in this wooden house as it is cool in summer and warm in winter. A free day to spend at your leisure. 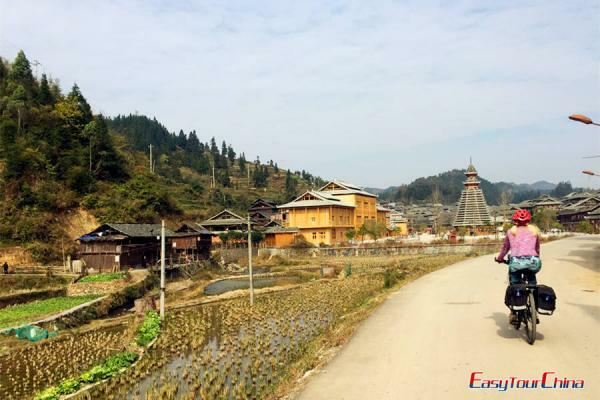 Highly recommend is taking a day hike to the nearby village of Dazhai which will take you through many villages only accessible by foot and through someof the most beautiful scenery in the area.Otherwise the village of Pingan is an interesting place to relax or bargain for handicrafts. There are several nearby view points to explore too if you don’t want to venture to far. Today's highlights: scenery change, cennection day from the north of Guilin to the south. We will follow the same road down to the parking lot and get our bikes and luggage back. And then our supporting van will drive us the first 25KM skipping the inevitable and boring cycling on the busy road with dangerous cars. We will start to cycle again at around 10:30am today. And we will need about 5 hours to finish the cycles due to a 4KM big climbing up and a long distance undulating along the lake and reservoir areas. Today's highlights: cycling along ancient canals, visiting the well-preserved ancient village, connection from the north to the south. Daxu is one of these and is a fine example of what old world China once was, with cobblestone lanes, a 400 year old stonearch bridge and people still living in wooden dwellings roofed inclassic black tiles. We’ll have plenty of time for a wander down the old streets, view the river side bustle and pop our heads into one of the old courtyard houses to see how the better off once lived. There’s plenty of antiques and curios on offer by the dozens of hawkers along the old main laneway. Along with the obligatory snake oil salesmen, you’ll find sellers offering Mao’sLittle Red Book and other communist paraphernalia, as well as purveyors of the weird and wonderful herbs and remedies. Today's highlights: back to nature, wetland boat drifting and an optional isolated gorgeous reservoir. During our ride through this flatter rural area we stop at several Ming era villages that retain their centuries-old architecture. Near Caoping we stop for lunch before a climb up to take in what the Chinese often refer to as ‘the finest scenery under heaven’ – Karst Mountains over hanging the river. We take a hilly route following the Li, glimpsing these spectacular mountains above and below, before a long downhill and flat run into Xingping, an old port village, and our guesthouse with its rooftop views over the river. Xingping is an interesting place to wander around and there are lots of little cafes and handicrafts to check out, adding to its charm. There are some spectacular look outs and swimming spots too. Today the tour takes to enjoy the limestone peaks, crisscrossing rivers, old bridges and ancient routes connecting villages. The difficulty level today is easy but the path crisscross the labyrinth of the small paths. Follow the leader closely. Today's highlights: single tracks and paths, bigger Karst view mountain areas. Today's highlights: comfortable route, farmland, challenge of mountain climbing. We will see the 400 year old Dragon Bridge, we cycle through small villages, pomelo groves, tea plantations and rice terraces.The final section of the day’s ride is through the stunning Dragon River Valley where we take dirt trails through rice fields surrounded with mountains before settling in a local farmer’svillage at one of the most charming hotels of the tour. Weather permitting; we’ll eat under the stars. 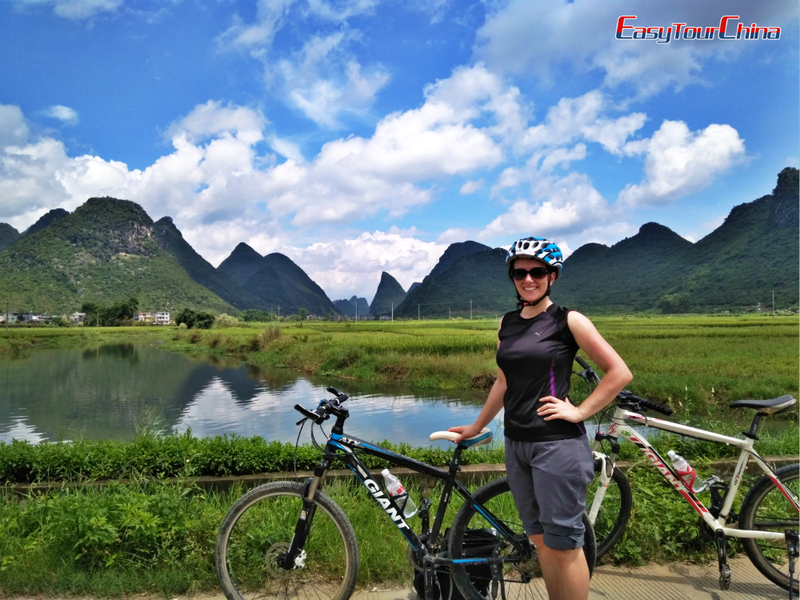 The bike takes us past the Liugong village, where we stop for a break to see the stunning scenery of Li river, before cycling through rural countryside along the Li River until we emerge in legendary Yangshuo. This once sleepy backpacker destinationis now a thriving little tourist town which is a fun place to relax and indulge a little! We stay in a centrally located hotel with easy access to the town. Tour starting date is available based on your requests. 2. Arrival airport pick-up service by our guide and driver to hotel on Day1.